Featuring large, curved handles for comfort, XuronÂ® Model 2175 ET slices hard-to-reach parts from sprue tree, leaving minimal sprue residue. Unit employs Micro-ShearÂ® blade bypass action to create smooth, clean cuts without pinching. Manufactured from high carbon steel with glare-eliminating black finish, professional sprue cutter has soft rubber hand grips and Light Touch(TM) return spring. It is recommended for use on soft plastic only. A new, professional sprue cutter that has been designed for scale modelers and features a large curved ergonomic handle and longer, low-profile blade bypass cutting jaws is being introduced by Xuron Corp. of Saco, Maine. 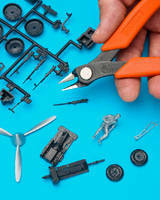 The Xuron® Model 2175 ET Professional Sprue Cutter for scale modelers is designed to slice hard-to-reach parts from the sprue tree; really close to the part, leaving minimal sprue residue. Featuring large, curved handles that fit comfortably in the hand, providing optimum stability for precise cutting, this cutter employs the patented Micro-Shear® blade bypass action to create smooth, clean cuts effortlessly and without pinching. Manufactured from high carbon steel with a glare-eliminating black finish, the Xuron® Model 2175 ET Professional Sprue Cutter has soft rubber hand grips and a Light Touch(TM) return spring. Recommended for use on soft plastic only, this modeling tool eliminates the possibility of costly or painful mistakes from a hobby knife, claims the firm. The Xuron® Model 2175 ET Professional Sprue Cutter sells for $22.95 (list). Literature and a complete product catalog are available upon request.